We began as a small comedy theater, and have grown to become today’s leading brand in improv-based sketch comedy. With a variety of theaters, training centers and full-time, touring ensembles, you can find us all over the world. And we have more than a handful of successful Second City alum that we aren’t too modest to mention, like Tina Fey, Chris Farley, Bill Murray, and Keegan-Michael Key. The Second City kept its momentum going in overdrive over the following decades, thanks to new co-owners Andrew Alexander and Len Stuart and tremendous expansion. The Second City opened several new experimental outposts during this period, from Santa Monica (where Robin Williams dropped by) to Detroit to Las Vegas, Denver, and Cleveland. Alumni of these shorter-lived theaters include Keegan-Michael Key and Jason Sudeikis. Mural at Piper's Alley. Photo by @jmoney0627 via Instagram. The marquee of e.t.c. Theater in Chicago. Photo by @millerhicks via Instagram. Detailing on the e.t.c. Theater marquee. Photo by @helloannaelizabeth via Instagram. Many of the world's biggest names in comedy--and their most famous characters--got their start at The Second City. Before he lived in a van down by the river on 'SNL,' Chris Farley's "Matt Foley, Motivational Speaker"'s first home was on the Chicago stage in the 1990 revue called 'Flag Smoking Permitted in Lobby Only, or Censorama.' Stephen Colbert was hired by the theater's box office in 1987 in exchange for free classes. Steve Carell joined Chicago's e.t.c. stage cast in 1990, and Tina Fey and Amy Poehler joined The Second Touring Company in 1994. Amy Poehler would also join Tina Fey at SNL. Photo by Anders Krusberg via Wikimedia Commons. Public figures have joined in the fun over the years, too. In 2007, then-Senator Barack Obama watched the revue, “Between Barack and a Hard Place.” The Second City's infamous (and always free) "Third Act," the totally improvised set that takes place after the cast takes its bow, has welcomed special guests like Tom Hanks, Paul Simon, Fred Armisen, and Chance the Rapper. This era also marked several new initiatives. 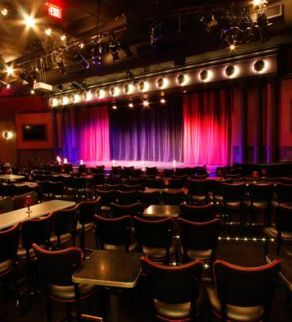 In 2002, The Second City expanded its Outreach & Diversity Program, furthering the critical mission of bringing new, diverse voices to the comedy landscape through annual programs like the Bob Curry Fellowship and The Break Out Comedy Festival. The Second City gives comedians from diverse backgrounds a chance to shine. Photo by @thesecondcity via Instagram. Cover photo by @daryl_mitchell via Flickr.